I stood up from the response time to see the front of the stage covered in people praying to let go of their past and leave regret behind. There were individuals, families, friends. In all, over two services, 32 people responded to the message. We had three first-time conversions for Christ and have eight signed up for baptism next week. 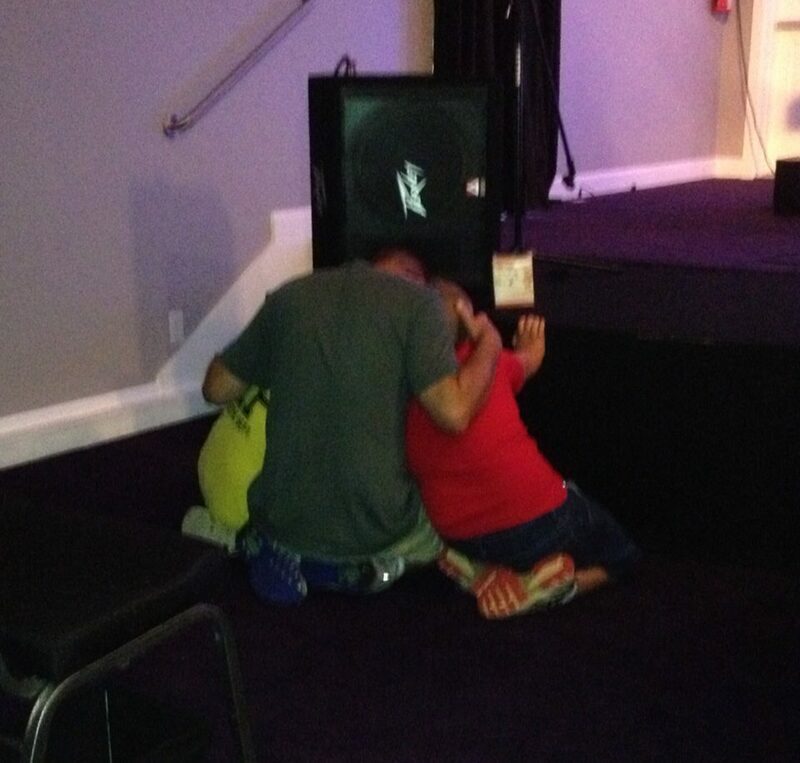 But as I returned to the front of the stage, I noticed two first-time guests rising from the prayer time. Both ladies - friends of one of our greeters - had come to Revolution Church after hearing about the services on social media. "I have never left my baby with anyone before." I could see the hesitation, and understandably so. So we assured her. It's why we divide our classes into age-appropriate environments. It's why we participate in a security check-in and check-out system. It's why we have name tags and code numbers if there is a need for the parent during the worship service, to discreetly display the code on the screen. It's why we background check our volunteers and ensure multiple adults in each environment. And so, she took her baby to our RevBabies nursery area. The baby stayed there through the service. And she, plus a friend she brought to church with her, got an opportunity to make a serious prayer time and talk to God in response to the message. Great job to our First Impressions and RevKids team. In closing, this is WHY. This is why we are on time. This is why we hold to our commitments. This is why we are prepared in our environment for guests. This is why we create environments so people can worship. This is why production matters, so the praise gets the attention. This is why we share about Jesus and our church to our friends. This is why social networking has a positive influence. This is HOW we exhibit LIVE. LOVE. SERVE. You make it happen, so THEY can connect to Jesus. It's not very often that I write a blog prior to speaking on the same topic, but that's exactly what I am going to do today. Sunday, we will continue the fourth week of what has been a fun and challenging series, "How I Met My Father" as we learn to find a couch and share our story. Your story includes some incredible moments, and it also includes some very stupid ones. Our toughest days can be an element of consequence, but more often than not, the resulting embarrassment is by our own ridiculous choices. I am no different. I'm going to share with you Sunday a story that you have never heard before, and it shaped me for who I am. It took a fight - yes, a physical one - to get me back in church and ultimately right with God. I paid a lot of "stupid tax" on purchases in my early years by using a credit card. My attitude, ego and self-control was so mismanaged that I hurt a lot of people on the way to finding what God had for me, and there are days I regret a lot of things in my past even though grace has allowed me to be forgiven. The skeletons in my closet don't need to be brought out when I can hear the rattle of the bones in my own head. And chances are, you are there too. In the show How I Met Your Mother (CBS), "Barney" is a high-strung, character-flawed socialite who carries the show. He's funny, but that's because he's a mess. He gambles with his mistakes and has an ego bigger than the moon. But his gambles can get him in trouble, and one day it goes to an extreme. His friend Marshall is pretty laid back, but Marshall is a lot bigger and more intimidating than Barney. So in an argument, Barney takes a gamble on what he believes to be truth - and he's wrong. A "bet" between friends leaves Barney with a choice. He can either be slapped 10 times consecutively by Marshall immediately, or he can be slapped five times - with no warning - at any point from then until eternity. Barney is a rebel, so in the "slap bet" he takes the five slaps at random intervals. To this point in the show, Marshall has used four. He has knocked Barney from a seat at the table, across the living room floor, crashed him in front of their friends, and buckled him over furniture. 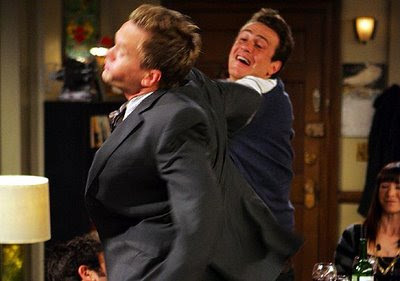 There is ONE slap bet left to dish out, and Barney has no idea when it's coming. And this is exactly how Satan intends for you to live when you make a mistake. He is torturing you, making you live in fear when your mistakes are going to come back and slap you in the face. Barney SHOULD HAVE taken his dose and ended it. But he CHOSE to live in fear when it could have been over. Christ died for your sin, so quit carrying it for all of your life! Take your medicine, and move on! Peter was an apostle of Jesus. He was by and large the most stubborn one, violently defending Christ and yet bold enough to challenge Jesus about his words when he did not understand. But Peter made a horrible decision, three-fold, denying Jesus at the very moment he had a chance to defend him. Peter's words were so cutting, cursing...echoing through the night as the apostle declared with force, "I do not know this man." Jesus ultimately was crucified and Peter retreated to the boat, not just to his former profession but back to the sea in a moment of sheer regret and skeleton-shaking horror as he contemplated what he had done. Regardless of the words of Jesus planning to return, to resurrect, to see them again, here was the village idiot soaking in his own self-pity in the boat. Is it harsh to call him the village idiot? Of course it is. But I am using that phrase for the own self-deprecation we feel when our mistakes come crashing down. We are guilty, and we know it. Peter got a second chance, and I want to tell you about that Sunday. You are worthy of a second chance, not because of how righteous you are, but because grace is not a gamble. Jesus died to set the very thing free that you beat yourself up with over and over again. Peter's story later emerged from utter disaster to incredible blessing. After Jesus ascended to Heaven, it was Peter who led 3,000 people to the gospel after the group emerged from the upper room. Peter saw a lame man walk again with the power of "Jesus Christ of Nazareth" in his right hand and his words. Peter stood before the high council and upheld Jesus after denying he knew Jesus in front of a few people in the courtyard. God didn't send his son Jesus to die for your sin just so you could use his grace as a get out of Hell free card. But he also didn't send his son to die for your sin so you could wake up every day and sulk in how worthless you are. The devil (Satan) is a master at false conviction. He tempts you to believe you can never be loved, never be saved, never be set free. Well, he's got one slap left, and God's holding the keys to hell and death. In the meantime, forgiveness comes with some tough earthly consequences. Your relationships may have been damaged, and you are likely going to face saying you are sorry. Some things you may never get back, and some hurts last a long time. But let it BECOME your story, not CONTROL it. Tell Satan you didn't gamble on grace. Your debt is paid. If anyone is going to get a spiritual smack in the face, let the arrogant one who thinks he's bigger than God take his own medicine. I'm perfectly thankful Christ took mine. You do not want to miss Sunday. A great Father's Day at Revolution! Happy Monday! 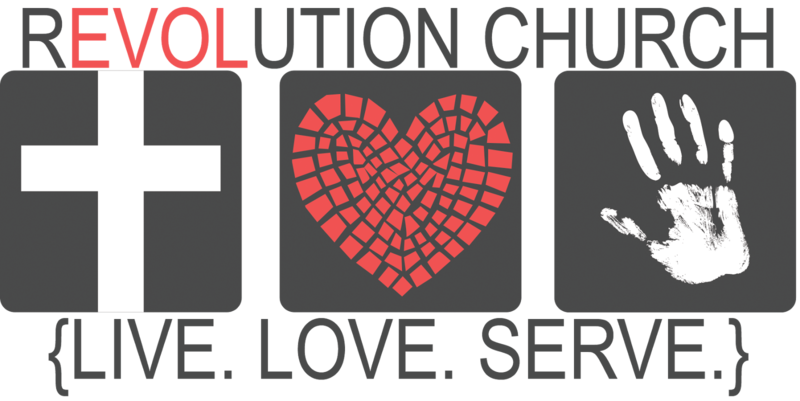 It's the day after Father's Day and I want to share with you some awesome things from Revolution Church from the past week. We learn to celebrate wins, and God has blessed us in a big way. Hope to see you next Sunday as we continue week four of How I Met My Father! - Sunday we had one person give their life to Christ, two people signed up for baptism and 24 families or individuals praying in response to a challenging message on parenting and sacrifice. - Our Jamaica team returned, and 13 people came to Christ or rededicated their lives. We ministered to two schools, three churches and over 1,500 kids total. i am very proud of our team. Our chapel on the campground is not yet built, but when the container gets released it will be. Trust God! - We have 26 people who have been on a mission trip to either Jamaica or Oklahoma City in the past two weeks. That's AWESOME! - Chris Alsup and Corey Freeman were just slamming it at the roadside! Chris says they had a 99 percent wave rate Sunday - c'mon, bro! What's wrong with the one person who didn't? Great job by our greeters! 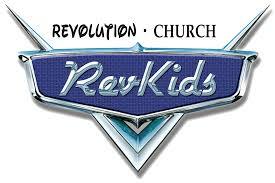 - We continue to add team members to our cleaning and maintenance, first impressions, greeters and had four first-time serving in RevKids last week. Our serve team rate is about 65 percent at church right now. That's awesome! - Worship for Father's Day - WOW! The Holy Spirit moved, and we just watched as God did some amazing things. "The Great I Am" in the second service was incredible and I was awed to see Ronnie Foster so overcome he couldn't sing, and the audience led it for him. That was cool. Really cool. 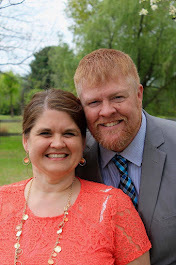 Want to give a shout to Pastor Ian Cullen, who did a fantastic job on June 9th while we were on the missions trip. If you want to check out his message, see it here. "Win: someone at Revive pulled me aside tonight and just wanted to let me know that since their family has been coming to Revolution Church the past few months they have experienced, wait for it....LIFE CHANGE! Their marriage is better, their kids behavior is better...yes ladies and gentleman that is what it is all about! Life Change! Got the Holy Ghost bumps while she was talking to me." Our serve team leaders are reading through 1 Timothy this week. Want to join us? We just want to celebrate what God is doing! 1. Live - Keep it all about life change. 2. Love - Treat people the right way and see them through God's eyes. 3. Serve - Make a difference, not an excuse. I love my church family, if you missed out this Sunday then you better get ready for next week because God is on the move! I have preached seven times this week. I am tired. But I love Jesus and can't wait to share with you next Sunday! Get a friend to church, you don't want to miss it! What's your win? Celebrate with us by sharing what God is doing with you! P.S. I got to return from Jamaica and see Man of Steel with my family for Father's Day. It's intense, but check it out! A lot of gospel parallels and Messiah implications for the main character. You'll see a lot of the Bible reflected in the movie. And Phil Mickelson didn't win the U.S. Open like I predicted. But I would like to offer my advice that he should have reduced club to the gap wedge on hole 13. Like I'm a pro or something. Just saying. Oh, Phil.